ANF, BEHDINAN ─ 10 revolutionary organisations from Kurdistan and Turkey have announced the establishment of Peoples’ United Revolutionary Movement as a unity of force and action formed in the wake of discussions ongoing since December. 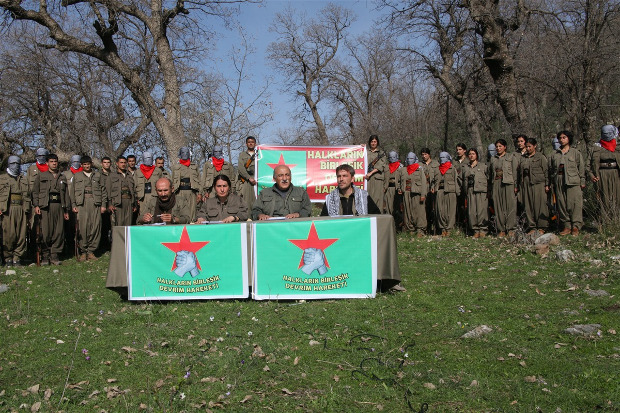 Representatives of 10 revolutionary organisations attended a joint press meeting in guerrilla zones to announce their alliance with the purpose of stepping up the revolution in all areas including armed struggle against the “collaborative fascist AKP and TC (Turkish Republic) system of sovereignty”. Speaking here before the press release, PKK Executive Committee Member Duran Kalkan listed the names of the following revolutionary organisations from Turkey and Kurdistan that got united to defeat fascism and become a glimmer of hope for peoples; TKP/ML, PKK, THKP-C/MLSPB, MKP, TKEP-LENİNİST, TİKB, DKP, DEVRÎMCÎ KARARGAH and MLKP. While Proletarian Revolutionary Coordination also joins the United Revolutionary Movement, Resurrection Movement has voiced favorable opinion to join the association. Kalkan said this unity of revolutionary forces has been formed to accomplish revolution against the AKP that is trying to establish a new fascist dictatorship by restoring the fascist military coups of 12 March and 12 September. He pointed out that the Peoples’ United Revolutionary Movement has also been announced on 12 March at the 45th anniversary of 12 March 1971’s fascist military coup, 21st anniversary of 12 March 1995 Gazi massacre, and 12th anniversary of 12 March 2004 Qamishlo massacre. Kalkan continued, inviting all those revolutionary organisations and societal circles that want to fight fascism to join the joint struggle. Kalkan’s speech was followed by the read-out of the joint declaration in Turkish and Kurdish, which called attention to the ongoing crisis and war in the Middle East that threatens the whole humanity. Stressing that the AKP government took part in one of the dirtiest alliances formed by regional and international powers in this bloody war, the joint declaration pointed to the all-out war the AKP is waging against all the peoples and opposition groups in the country today, with especially the Kurdish people suffering a massacre under tank and artillery fire targeting their ancient living areas. “The Turkish Republic is trying hard to establish a one-party dictatorship and suppress the entire opposition by gathering behind itself all the traditional, modern, reactionary and fascist powers of the system of sovereignty. This bloody and fascist alliance is being sustained over enmity against Kurds today. The heavy destruction, pain and exploitation created by regional powers has brought the revolutionary state to maturity and paved the way for Peoples’ United Revolutionary Movement. Defending and progressing the Rojava revolution, Kurdish resistance for self-rule and United Revolutionary Struggle of our peoples means defending the life safety and future of all the oppressed, laborers, intellectuals, democrats and all the people. No social circle in Turkey has a safe future within this system as all opposition powers are under attack. If the Kurdish resistance for self-rule gets broken, the AKP government will suppress the entire opposition in Turkey with blood in the same aggressiveness and cruelty. The future of progressive, revolutionary and pro-labor circles in Turkey is therefore intertwined with the future of the Kurdish resistance”, the declaration said. The statement underlined that Peoples’ United Revolutionary Movement aims to attain democracy and free future for peoples against imperialism, capitalism, chauvinism, fascism and racism, by considering the overthrow of the fascist AKP ruling with all its social bases through popular revolution as essential. Peoples’ United Revolutionary Movement called upon everyone harmed by fascism and reactionism, mainly women, youth and workers to get organised, united and fight for freedom, democracy and fraternity of peoples.